Alex Hill, right, and Justin Duhe, left, walk through the coconut groves at Coco Rico, Homestead, FL. As he transitions out of the military this fall, Justin Duhe is going into business for himself. The 28-year-old Army linguist and cyber specialist bought a five acre coconut grove in Homestead, Fla. last year – sight unseen. He knew nothing about coconuts at the time. Justin Duhe bought his 5 acre coconut farm as an investment as he transitions out of the Army. But while his new career running Coco Rico Farms will be vastly different from what he did in the Army, Duhe said his military experience will still be an asset. Noting that he learned Farsi in 47 weeks in the Army, Duhe said he’s not afraid of challenges. And his time in the military has helped him build a business network. He wasn’t in Florida long before crossing paths with a veteran in the food business who was looking for a fresh coconut supplier. The two Army men bonded instantly. Duhe and Alex Hill, owner of Florida Coconuts, became “business” battle buddies – not partners, but supplier and vendor. Alex Hill, Army veteran and owner of Florida Coconuts, met Duhe online while searching for a new supply of fresh Florida coconuts. Hill, who was in the Army Airborne, sells fresh coconut water to tourists along the beach. He said it’s not the first time he’s done business with other people who’ve been in the military. “They have a similar work ethic as you and also uphold those similar values that you have. It’s hard to find people that have the same values outside the military,” Hill said. Green coconuts are the best source for fresh coconut water. About 2.5 million veterans own businesses. According to the Syracuse University Institute for Veterans and Military Families, veterans own 13 to 15 percent of small businesses, though they’re only eight percent of the population. Women veterans are driving the trend, according to Misty Stutsman, the director of entrepreneurship and small business at the institute. To offer veterans the option of self-employment, the Institute developed several entrepreneurship programs including some that are specifically for women veterans, active-duty, and military spouses. “Communities are investing in these programs to make sure that the next generation of entrepreneurs is supported,” Stutsman said. Veteran-owned startups have attracted the attention of states, universities, and other agencies. The success record among veteran-owned startups has attracted the attention of states, universities, and other agencies. The US Small Business Administration Veteran Business Outreach Centers offer a range of resources and training in conjunction with more than 20 partners. There are non-profit organizations like Bunker Labs, created by military veterans for veterans interested in a start-up. Veterans Florida – a non-profit corporation created by the state of Florida – offers free classes, mentors, and an annual “Battle of the Pitches” where “vetrepreneurs” compete for cash prizes. Florida Coconuts, Hill’s company, won second prize – $7500 – at the 2018 competition. The first prize was awarded to Axon Motor Company in Clearwater, Fla.
Hill’s prize came at a good time. A drop in the coconut supply and a seasonal dip in tourism hurt his business, so he’s pursuing a new entrepreneurial idea. He is working to design a better coconut opener. More than 70 years after the end of World War II, Congress finally passed a measure that President Barack Obama signed on Friday allowing Women Airforce Service Pilots the honor of having their ashes buried at Arlington National Cemetery. The law overturns an Army decision that exclude the female pilots. According to the Military Times nearly 1,100 women served from 1942 to 1944, ferrying airplanes, training combat pilots and towing airborne targets. Thirty-eight died during training and support missions. Their recognition and cause became one of the few bipartisan congressional efforts so far this year. You can read the full article here. Throughout the Tampa Bay region, Florida and the nation, special ceremonies are planned to recognize the sacrifice of those who served in the U.S. Armed Forces and those who are currently serving. You can find the Veterans Day events nearest you at a Department of Veterans Affairs website or check the listings below. And if you can’t make it to a ceremony or parade, there are alternative opportunities to honor a veteran year-round, check them out. PINELLAS COUNTY PARKS – how The parking fees at county parks on Veterans Day is beign waived to show appreciation for local veterans and their families. The offer applies to all visitors: all county boat ramps, Howard Park in Tarpon Springs, Sand Key Park in Clearwater and Fort De Soto Park in Tierra Verde. Other county managed parks offer free parking daily. A list of Pinellas County parks is available at www.pinellascounty.org/park. SARASOTA – ROBARTS ARENA – 7 AM – The 2nd Annual Veteran’s Day Breakfast, at 3000 Ringling Blvd., Sarasota, FL, features keynote speaker retired General Charles Shugg, a music medley and Vietnam Vets who will receive a commemorative pin in honor of the 50th anniversary of the Vietnam War. The breakfast benefits the Sarasota Kiwanis Foundation and Goodwill Manasota’s Veterans Services Program. $25 per person. Register at 941-925-2970 or SRQKiwanisVeterans-DayBreakfast@gmail.com. ST. PETERSBURG – WILLIAMS PARK – 8 AM – The 2nd Annual Veterans Day Celebration featuring patriotic songs from the Gibbs High School Pinellas County Center for the Arts Choir, St. Petersburg Mayor Rick Kriseman and honored military veteran Willie Rogers, who served as a Master Sergeant for the Tuskegee Airmen in World War II. The ceremony is planned in front of the Veteran’s Memorial at Williams Park, 1st Avenue and 4th Street N., St. Petersburg, FL. NEW PORT RICHEY – RIVER RIDGE CENTER FOR THE ARTS – 9 AM – The Pasco County School District is holding a district-wide Veterans Day Ceremony featuring keynote speaker U.S. Rep. Gus Bilirakis, the River Ridge ROTC, Pasco County Schools veteran alumnus and music provided by River Ridge Middle and High Schools, and the Cypress Elementary School Chorus. Winner of the Pasco Constitutional Officers Essay Contest will be announced. The event to honor and celebrate is at River Ridge Center for the Arts, 11646 Town Center Rd., New Port Richey. SARASOTA – DOWNTOWN – 10 AM – The Sarasota Veterans’ Day Parade with the theme “When Duty Calls,” starts at Main Street and Osprey Avenue and proceeds down Main Street to J. D. Hamel Park on Gulfstream. A Veterans Day Ceremony is planned around 11:00 a.m. after the completion of the parade. The special guest speaker is Army Col. (retired) Stephan D. Cork, the original commandant of Sarasota Military Academy. Sponsored by the Sarasota Patriotic Observance Committee. VENICE – PATRIOT’S PARK – 10 AM – A ceremony, sponsored by the Marine Corps League 643 of Nokomis, will include the presentation of the colors, the Venice Police, Venice H.S. Marine Corps JROTC plus the Sun Coast Wind Ensemble. The observation is at 800 Venetia Bay Blvd., just off Route 41 south of Roberts Bay on the east side. Following the ceremony all veterans are invited back to the American Legion NO-VEL Post 159 in Venice for the Veteran’s Day Open House. 1770 E. Venice Ave., Venice. BUSHNELL – FLORIDA NATIONAL CEMETERY – 11 AM – Keynote speaker Don Hahnfeldt, a retired Navy veteran and chairman of the Sumter County Commission, is a highlight of the Veterans Day Ceremony moderated by Steve Jerve of WFLA-TV and with music by the Pasco High School Band. Seating is limited so you’re encouraged to bring chairs or blankets. Florida National Cemetery, 6502 SW 102nd Ave., Bushnell, FL. HILLSBOROUGH VETERANS MEMORIAL PARK – 11 AM – The Annual Veterans Day of Remembrance ceremony will highlight JROTC students from several high schools including Bloomingdale, Chamberlain, Hillsborough, Middleton, Newsome and Riverview scheduled. The presentation includes students performing exhibition drills, presenting poems, and leading participants in the Pledge of Allegiance. The event at the Veterans Memorial Park, 3602 N. U.S. Highway 301, Tampa, FL, is free and open to the public. SAINT LEO UNIVERSITY – 11 AM to 4 PM – A ceremony and service projects will mark Veterans Day starting with a ceremony with keynote speaker Major General James S. Hartsell, USMC, at the Student Community Center followed by several student service projects: the Peace Paper Project from 12:30-4 PM; Theta Phi Alpha sorority “Sending Kisses to the Troops” care package project 12:30-4 PM; The Circle of Veterans providing resources and information for veterans 12:30-4 PM. A performance by the J2 Band will run from 1:30-4 PM. The campus is located at 33701 State Road 52, four miles east of Interstate 75 (Exit 285) in the town of Saint Leo. Parking is available in the campus garage.The events are free and open to all veterans, active military, and the local community. LONG BOAT KEY – 2:30 PM – A Veterans Day Parade, starting at Bay Isles Road (behind the Publix) to Temple Beth Israel, 567 Bay Isles Rd, will feature a VFW Color Guard, Fire Truck, and Marching Band. A program of “Memorable Moments” is planned at the end of the parade followed by refreshments for participants. More info at: jackrozance@att.net, eugenelu@comcast.net. SARASOTA NATIONAL CEMETERY – 2:45 PM – Opening ceremonies followed by the Annual Veteran’s Day Mass at 3 p.m. with Bishop Frank J. Dewane. The service honors the men and women who have served our country and are serving us today. There will be ample seating and parking. Sarasota National Cemetery, 9810 State Road 72 (Clark Road), Sarasota, FL. LARGO CENTRAL PARK – 5 PM – The city of Largo is presenting a ceremony with a keynote speaker, music and a color guard presentation is free and open to the public at the Central Park, 101 Central Park Drive, Largo. TAMPA – WATER WORKS PARK – 5:30 PM – A free Veterans Day Observance and Patriotic Concert, hosted by the city of Tampa, 1710 Highland Ave., Tampa, FL. It will feature members from MacDill Air Force Base, U.S. Central Command and entertainment by the Eastern Hillsborough Community Band, as well as a salute to veterans and local Medal of Honor recipients. The event will also feature a display of several pieces of vintage military equipment stationed within the park. SARASOTA HIGH SCHOOL – 7 PM – The Singing Sailors from Sarasota High School host a free, Veterans Salute concert with a guest choir from Booker Middle School. The public concert is at Sarasota High Auditorium, admission. 1000 S. School Ave., Sarasota, FL. TAMPA – UNIVERISTY OF TAMPA – 7:30 PM – A free concert of American music featuring organist Ryan Hebert and celebrating those who served in the Armed Forces is planned at the UT Sykes Chapel, 401 W. Kennedy Blvd., Tampa. SAINT LEO UNIVERSITY – 8-10 PM – Moonlight Madness highlighting a student veteran color guard, a national anthem soloist and a mental toughness challenge game is planned on campus at the Marion Bowman Activities Center, 33701 State Road 52, four miles east of Interstate 75 (Exit 285) in the town of Saint Leo. The event is free and open to all veterans, active military, and the local community. TAMPA – PORT TAMPA BAY TERMINAL #2 – 9 AM-1 PM – A Job Fair and free classes on how to conduct a job search are open to veterans and persons with disabilities. The Mayor’s Alliance for Persons with Disabilities is sponsoring the event with 29 employers that are looking to hire veterans. It’s being held at Port Tampa Bay Terminal 2, 651 Channelside Dr., Tampa, FL. You can pre-register at www.tampagov.net/jobfair. SARASOTA HIGH SCHOOL – 7 PM – The Singing Sailors from Sarasota High School host a free, Veterans Salute concert with a guest choir from McIntosh and Sarasota middle schools. The public concert is at Sarasota High Auditorium, admission. 1000 S. School Ave., Sarasota, FL. NEW PORT RICHEY – VET CENTER – 8:45 AM-4:15 PM – A full day of free sessions for veterans and their family members is being offered at the Pasco County Vet Center, 5139 Deer Park Drive in New Port Richey, FL. The seminar starts with a session on Readjustment Counseling Services, followed every hour with a new topic: VA Home Based Primary Care/Medical Foster Homes, Veteran Burial Benefits, Elder Law & Changes to Caregiver Benefits, a free lunch, VA Claims, Veteran Preference and How to Use It, Employment, VA Mortgage/Real Estate. There’s only room for 30 at each session so pre-registration is requested. Call 727/372-1854. TAMPA – RAYMOND JAMES STADIUM – 7 PM – The University of South Florida Tillman Scholars and other military veterans will be recognized at half-time at this year’s Salute to Service Football Game featuring the University of South Florida vs Temple. 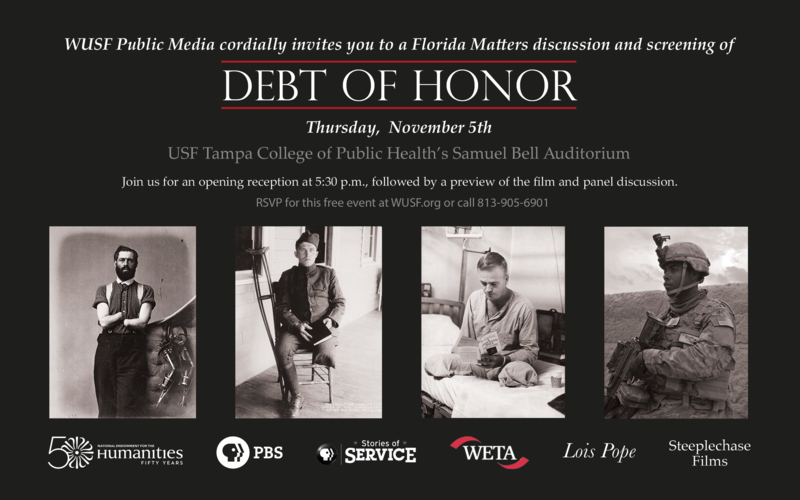 The USF Office of Veterans Services has partnered with USF’s Athletic Department to sponsor this event. RESTAURANTS – From Applebee’s to Village Inn – Military.Com has a full, national listing of restaurants offering free meals or discounts to veterans and active-duty military on Nov. 11, 2015 Veterans Day. You can check-out the list and links. HART BUS RIDES – Hillsborough Area Regional Transit Authority (HART) will offer free rides to U.S. military veterans on Veterans Day, and to all members of the armed services, both active and retired, as well as to their family members and dependents. Riders are asked to show a valid military or veterans ID card when boarding any HART bus to qualify for a free ride. This offer is not valid for use of HARTPlus service or the TECO Line Streetcar System. ATTRACTIONS & MUSEUMS – Several museums and local attractions are offering free admission to military personnel from active-duty to retired veterans and discounts for additional guests and family. You can check-out the Veterans Day admission offerings. The WUSF Florida Matters Town Hall taping is Thursday, Nov. 5 at the University of South Florida Tampa campus, in the College of Public Health’s Samuel Bell Auditorium (13201 Bruce B. Downs Blvd., Tampa, FL 33612). Please join us at 5:30 p.m. for an opening reception, and the taping that starts at 6 p.m. Seating is limited and registration is required. Please RSVP at this link, or call 813-905-6901. It will be moderated by Carson Cooper, the host of WUSF’s weekly public affairs show. 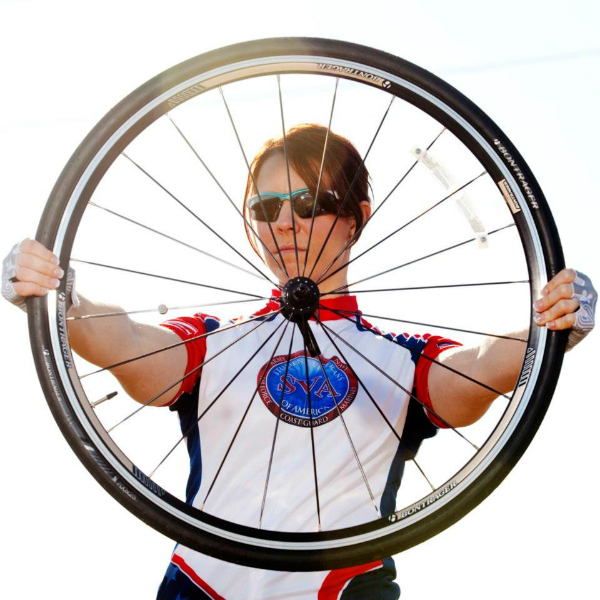 Kiersten Downs “takes the wheel” as she prepared for her cross-country cycling ride to raise awareness of student veterans and money for the Student Veterans of America. Women are the fastest growing group within the veteran population according to the Veterans Health Administration. Yet female vets may not identify themselves as a veteran or use their VA benefits. Why women vets avoid mentioning their military service is one of several questions being explored by University of South Florida doctoral student Kiersten Downs. Her dissertation, “Women Veterans and Re-Entry after Military Service- A Research Study,” will include information from an anonymous, online survey of women veterans from all eras. She’ll also interview both female and male veterans and community stakeholders. Bringing the veterans’ experiences to elected officials and policy makers is the mission of her dissertation research. “My overall goal is to really advocate for our population for greater representation in Washington DC and also at the state and local levels and to use the experiences that I’m gathering from other women veterans to ultimately change policy so that it serves us and our population,” Downs said. Women veterans are invited to take the online survey. There’s also an opportunity to volunteer for an additional phone interview. She will also maintain, a blog, a Facebook page on her women veterans re-entry dissertation and has a Twitter handle, @WmnVetsResearch.. If Downs sounds like a familiar voice, she also served as the community outreach coordinator for WUSF’s Veterans Coming Home project in 2014. She is the former president of the USF Student Veterans Association and the summer of 2013 she cycled across the United States to raise awareness of student veterans. Her ride also raised more than $50,000 in donations for the national Student Veterans of America.